Thanks SO much for all the positive feedback on the velvet jacket. I just want to let you all know that it was a HUGE hit at the engagement party. I'm so glad that I both made it AND wore it. I have to admit that I almost chickened out at the last minute, knowing full well that I would be the only man not wearing a suit and tie... which I was. But no other guy got touched as much! The grandmother of the bride-to-be, a very stylish woman, was particularly taken with it, and threatened to rip it off me on several occasions. I lost track of how many martinis she'd had! It was an amazing party and great fun. I know I wasn't feeling all that positive about the jacket, which was foolish in hindsight. I think we all have a tendency to judge our work quite severely. I know I do. As home sewists it's easy to get all caught up in every little detail, and fail to see the bigger picture. I don't think anyone was scrutinizing my seams or buttonholes. What they saw was ME, wearing a fabulous jacket, and that's quite enough. Now I'm actually looking forward to an event where I can wear it again! And isn't that one of the best things about making our own clothes? The joy of wearing things that we truly love. Engagement party over, now it's on to the wedding which will take place on tony Martha's Vinyard in late August. Hmmm what does the eccentric uncle wear to this shindig? On my mental "Pinterest board" I'm pinning random ideas... wedding, New England enclave of the rich and famous, nothing too formal, fun vs stuffy, casual but classy, lighter vs darker, strong "prep" vibe, colorful, outside reception in tents overlooking the ocean, potentially very hot (or raining). The image forming in my head.... A suit (yes, the real deal, jacket and trousers), cotton, poplin, maybe seersucker or pincord, with a floral shirt and a vintage Rooster skinny knit tie. Are you still with me? Now to make it happen! I had the chance to be in NYC for just a day, and I took full advantage of it. I was a man on a mission, so I made a beeline to Elliott Berman on W 35th. I just can't say enough about this place. A treasure trove. Just be warned that they're not open on weekends. As I'd hoped, I was able to "knock it out of the park" in just one store. As always, thanks to Eugenia of EBT for encouraging me to "go bold, or go home"! A French floral cotton shirting in tones of peach, orange, gold and mulberry on a black background. 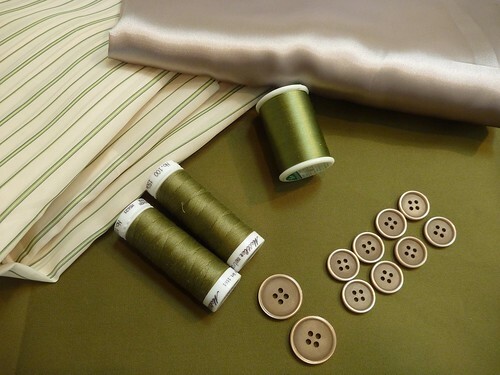 An Italian olive poplin (actually a micro twill) which is 80% cotton, 20% silk with NO stretch. This shirting was love at first sight! It was the boldest of three prints I considered, all gorgeous in their own right. It's a full 54" wide, so I can easily get a shirt out of 2 yards. 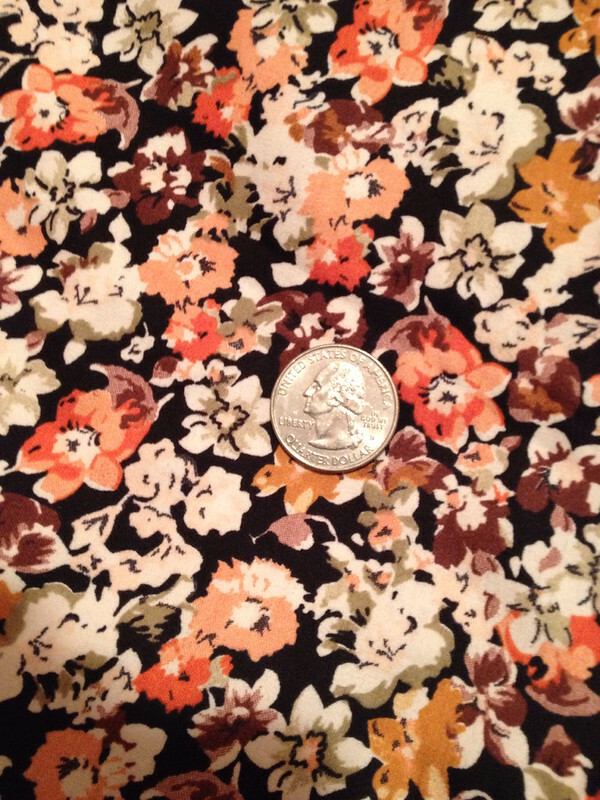 End result....a very Liberty looking shirt for $24. Score! I'm wanting to make this up right away and start wearing it. It's no secret, I'm completely enamored with floral shirts these days. The olive poplin has a wonderful weight and crispness to it, and best of all....NO stretch. I've really come to dislike stretch fabrics for tailored garments. They just don't "act right". Olive is a great color for me and I always feel confident wearing it. So this fabric has all the makings of great classic summer suit. Not wasting any time, I scurried around the garment district getting the other supplies I'll need. The linings are from A&K fabrics. I picked up both polyester and a spool of olive silk thread at SIL for all that hand sewing I'll be doing. The buttons I'm not 100% sold on. They looked great in the store, but not so hot now that I have them home. That's easy to fix, and there's plenty of time to swap them out. I'll be using a set of premade lightweight hair canvas jacket fronts from B Black and Sons. I'd rather put my efforts into other more technically challenging parts of the project. 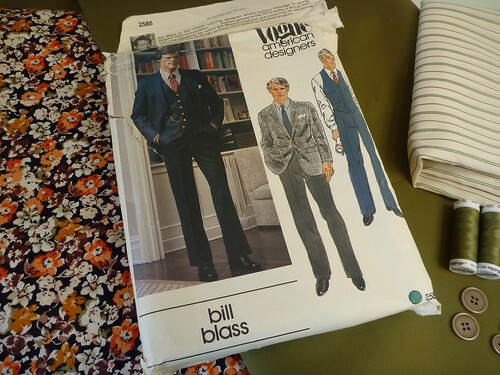 I'm going to be using this vintage Bill Blass pattern which is all over eBay and Etsy. It's a two button jacket with moderate lapels and double back vents. The trousers are basic flat front. This is a classic pattern that looks as relevant today as it did when it was originally issued IMO. Some of you may recall that I riffed off this pattern last year to make my lapel-less silk patchwork jacket. I've gotten into the habit of saving my muslins, so a big chunk of the fitting has already been done. I'll just need to redo the fronts, add the collar and possibly adjust the back. It will be nice not "reinventing the wheel" this time. As much as I'd like to dive into that floral shirting, I have another project in the pipeline.... My first pair of pants! Wish me luck. Awesome jacket! Love, love,love it. I will seriously have to consider making one for my husband. He would love one. I love your new fabrics. One of my thoughts for fabrics for the Martha's Vineyard wedding was a lightweight linen although I love your seersucker idea. Linen poses the wrinkle issue which I am comfortable with, but perhaps you are not. You can look rather rumpled rather quickly, but for breathability on a potentially hot and muggy day, it's hard to beat. I did a coral linen jacket for the last family wedding. As much as I love linen, I wanted a change this time around. I see. That makes a lot of sense. I know your jacket looked fabulous. The photos did. We are always the most critical of ourselves. Can't wait to see your suit. Go go go! Loved your velvet jacket - love your new fabrics - you will be the best dressed uncle at the wedding! You will find trousers a doddle after all those jackets! How exciting! 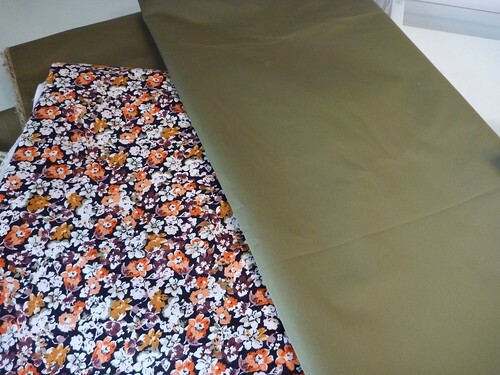 I absolutely adore the olive poplin - it's one of my favourite colours for pants at the moment. And the floral print works beautifully with it! Very much looking forward to following along as you progress towards a completed outfit :) Goodluck with the pants!